This is a case report of a patient who developed chronic renal dysfunction and neurologic emergency with multiple cranial lesions after liver transplantation. Immune-complex glomerulonephritis was confirmed on the basis of histopathologic evaluation of the renal biopsy. According to clinical features and brain magnetic resonance imaging follow-up, neuroradiographic atypical reversible posterior leukoencephalopathy syndrome (RPLS) was finally diagnosed. The development of chronic kidney disease (CKD) has emerged as one of the most important complications experienced after liver transplantation, which has a significant impact on graft and patient survival. Calcineurin inhibitor (CNI) such as FK506 nephrotoxicity has long been considered to be the major contributor to CKD but it may be over-rated (1). Reversible posterior leukoencephalopathy syndrome (RPLS), an uncommon clinical entity characterized by specific clinical and radiologic findings, is a rare neurological complication after transplantation and the subsequent use of immunosuppressive agents (2, 3). Either CKD or RPLS complicating liver transplantation has been reported with increased frequency (4-6), both of which rarely occur in one liver-recipient. Here, we present the case of a 53-year old liver transplant recipient who developed both CKD and multiple cranial lesions consistent with RPLS. A 53-year old Chinese male underwent orthotopic liver transplantation (OLT) because of hepatitis B virus (HBV) induced cirrhosis and primary liver cancer 16 months ago. He did well after transplantation and the immunosuppression consisted ofFK506, mycophenolate mofetil and prednisone. Ten months before admission, he took a number of routine laboratory tests. Live function and alpha-fetoprotein (AFP) tests were normal. The urine was positive (++) for protein and (+) for blood. The creatinine was 171 µmol/L (normal range: 45-84 µmol/L) and blood urea nitrogen (BUN) was 9.60 µmol/L (2.9-8.2 mmol/L). Besides monitoring renal function, he received no treatment for kidney disease. The creatinine and BUN had been reported to be slightly high since then. Five days before admission, he experienced headache and visual disturbance which he attributed to the high blood level of FK506 (11.7 ng/ml). The dose of FK506 was tapered but symptoms still gradually worsened. On the day of admission, he visited the emergency room because of severe headache and visual deterioration, accompanied by nausea and vomiting. The patient had no history of hypertension, diabetes mellitus, CKD or neurologic disease before liver transplantation. On physical examination, his blood pressure was 228/116 mmHg, pulse rate was 110 beats per minute, respiratory rate was 20 per minute and body temperature was 36.7 ÂºC. The chest examination revealed no abnormal findings. There was no hepatomegaly or splenomegaly on abdominal examination. Neurologic examination was normal except for left-sided homonymous hemianopia. Papilloe-dema and haemorrhage were found on the funduscopic examination. The urine was positive (++++) for protein and (+++) for blood. The creatinine and serum BUN levels were 299 µmol/L and 12.70 µmol/L, respectively. The white cell count was 5.7 x 109/L (4.0 - 10.0 x 109/L), with 90.7% neurotrophils (50.0 - 70.0%), 5.4% lymphocytes (20.0-40.0%), 3.7% monocytes (3.0 - 10.0%) and 0.2% eosinophils (0.5-5.0%). The haemoglobin was 91 g/L (113-151 g/L) and the platelet was 83 x 109/L (101-320 x 109/L). The pro-thrombin time was 11.6 seconds (14.5-21.5 s). The serum electrolyte showed that sodium was 143 mmol/L (136-145 mmol/L), potassium was 3.79 mmol/L (3.5-5.2 mmol/L), chloride was 106 mmol/L (96-108 mmol/L), calcium was 1.95 mmol/L (2.032.53 mmol/L), magnesium was 0.55 mmol/L (0.70-1.10 mmol/L) and phosphorus was 1.16 mmol/L (0.87-1.45 mmol/L). Total protein was 47.8 g/L (64.0-83.0 g/L) and albumin was 29.4 g/L (35.0-55.0 g/L). Alanine aminotransferase was 8 U/L (5-35 U/L) and aspartate aminotransferase was 19 U/L (8-40 U/L). The levels of total and direct bilirubin were 15 and 5 µmol/L (0-21 and 0-5 µmol/L), respectively. Cholesterol was 5.12 mmol/L (3.145.86 mmol/L). The FK506 was 4.8 ng/ml. 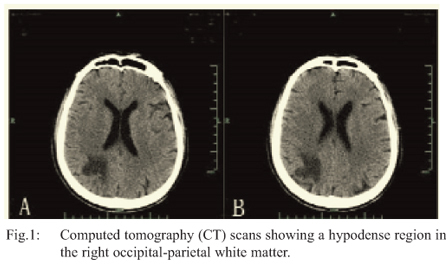 and computed tomography (CT) scanning of the head without contrast showed a hypodense region in the right occipital-parietal white matter (Fig. 1). Clopidogrel was administered under the suspicion of cerebral infarction. Intravenous (IV) urapidil and mannitol were prescribed to control hypertension and increased intracranial pressure. Human serum albumin was infused due to low levels of serum albumin. On the fourth hospital day, magnetic resonance imaging (MRI) scan of the brain was obtained which revealed multiple imaging abnormalities in the right occipital-parietal white matter, right temporal and both occipital lobes. They appeared hypointense on diffusion weighted imaging (DWI) and T1-weighted sequences and hyperintense on T2-weighted sequences (Fig. 2). Neuroradiographic atypical RPLS was considered. Clopidogrel was discontinued and blood pressure and intracranial pressure were controlled more aggressively than before. During admission, the creatinine level was between 299 and 204 µmol/L. On the eighth hospital day, a renal biopsy was performed. Light microscopy with immunofluorescence staining for IgM and complement of a kidney biopsy specimen (containing 25 glomeruli) showed the presence of mesangial proliferative glomerulonephritis coupled with global glomerulosclerosis (25 glomeruli) and crescent formation (5 glomeruli). This was confirmed by electron microscopy. Immunohistochemistry was negative for HBs and HBc. Besides FK506, mycophenolate mofetil and prednisone, losartan was added. The patient gradually recovered without any neurological sequelae. Resolution of the areas of increased T2 signal was observed on repeated MRI on the 25th hospital day (Fig. 3). According to the consensus of the International Liver Transplantation Society, the reported incidence of CKD was 30% to 90% after OLT, and 2% to 5% per year for end-stage renal disease (ESRD) requiring renal replacement therapy (7). Chronic kidney disease in liver transplant patients was customarily considered to be secondary to CNI nephrotoxicity. The kidney biopsy findings showed that OLT patients had a wide array of renal pathological abnormalities not readily attributable to CNI toxicity. Besides CNI nephrotoxicity, there were some specific histopathological features such as nephroangiosclerosis, diabetic nephropathy, thrombotic microangiopathy and other complex pathological findings (8-10). Immune-complex glomerulonephritis might be common and often clinically silent in patients undergoing liver transplantation for Repatitis C virus (HCV)-induced cirrhosis, which might be a potential cause of CKD after en-graftment (11). The index patient's kidney histology showed mesangial proliferative glomerulonephritis coupled with global glomerulosclerosis and crescent formation. Hepatitis B virus-related glomerulonephritis was excluded because immunohistochemistry was negative for HBs and HBc. We speculate that immune-complex glomerulonephritis might also be clinically silent in patients with HBV-induced cirrhosis as in patients with HCV-induced cirrhosis undergoing liver transplantation, which would potentially cause CKD. Treatment of CKD after liver transplantation is difficult. Mycophenolate mofetil was deemed not to be associated with nephrotoxicity and could prevent the progression of immune-complex glomerulonephritis. In the index patient, the dose of tacrolimus was reduced and the dose of mycophenolate mofetil was added as clinically tolerated. Losartan was administered to control blood pressure and decrease the excretion of urine protein. 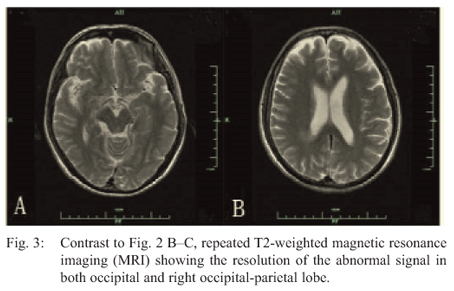 Reversible posterior leukoencephalopathy syndrome was first described as a clinical and radiological disease entity by Hinchey et al in 1996 (12). Recent clinical series also confirmed RPLS as a distinctive clinico-radiological syndrome characterized by seizures, encephalopathy, headache and visual disturbance, associated with abnormalities seen on MRI. Aetiologies for RPLS included hypertension, eclampsia and immunosuppressive or chemotherapeutic agents. Co-morbid conditions include malignancy, transplantation, autoimmune disorder, renal disorder, systemic infection and history of alcoholism, illicit drug usage, or medication overdose. Reversible posterior leukoencephalo-pathy syndrome is considered as a result of hypertension and hyperperfusion-induced cerebral vasodilation or less cerebral vasoconstriction and direct cerebral endothelial injury by immunosuppressant and chemotherapeutic drugs (12-14). The index patient presented with headache and visual symptoms, co-morbidity with liver transplant, CKD and hypertension. Both hypertension-triggered hyperperfusion and FK506-induced neurotoxicity are thought to be involved in the development of RPLS. Neuroimaging study is necessary for the diagnosis of RPLS. The abnormality on neuroimaging usually involved the white matter in the posterior portions of the cerebral hemispheres, especially the posterior parietal and occipital lobe but neuroradiographic atypical or variant images were also frequently seen (12, 13, 15). Computed tomography showed areas of low attenuation. T2-weighted image, fluid-attenuated inversion recovery (FLAIR) image and apparent diffusion coefficient (ADC) map showed hyperintense signal and DWI image showed hypo or isointense signal, indicative of cerebral vasogenic oedema (12). Recent studies also confirmed that a low proportion of patients showed cytotoxic oedema with hyperintense signal on DWI and FLAIR image (15). Magnetic resonance imaging is more sensitive than CT, particularly to neuroradiographic atypical or variant RPLS. Based on CT scan, the patient was initially misdiagnosed as cerebral infarction and further MRI scan confirmed neuroradiographic atypical RPLS. As reported, decreased low albumin level (29.4 g/L) was a risk factor for the development of posterior reversible encephalopathy syndrome (PRES) in the index patient (16). With control of hypertension and cranial pressure, reduction in dose of FK506 and substitution of albumin, the index patient's symptoms completely resolved after 10 days. Moreover, a follow-up MRI three weeks later showed near total resolution of the abnormal signals with only slight hyperintensities in the white matter of the right parietal lobe. In conclusion, we presented a case of a liver recipient who developed CKD after transplantation not exclusive by FK506-induced nephrotoxicity. Renal biopsy was important to confirm the cause of CKD. He then developed RPLS because of renal hypertension and FK506-induced neurotoxicity. Once neurologic complications occur, one should assess the reversibility and take prompt treatment to prevent continuing injuries. 1. Lake JR. Hot-topic debate on kidney function: renal-sparing approaches are ineffective. Liver Transpl 2011; 17 (Suppl 3): S50-S53. 2. 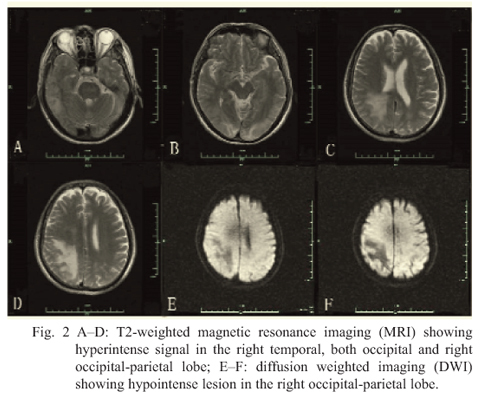 Liman TG, Bohner G, Heuschmann PU, Endres M, Siebert E. The clinical and radiological spectrum of posterior reversible encephalopathy syndrome: the retrospective Berlin PRES study. J Neurol 2012; 259: 155-64. 3. Lanzino G, Cloft H, Hemstreet MK, West K, Alston S, Ishitani M. Reversible posterior leukoencephalopathy following organ transplantation: description of two cases. Clin Neurol Neurosurg 1997; 99: 222-6. 4. Ramachandran J, Juneja R, John L, Dutta AK, Chen JW, Woodman RJ et al. Chronic kidney disease following liver transplantation: a South Australian experience. Transplant Proc 2010; 42: 3644-6. 5. Emiroglu R, Ayvaz L, Moray G, Karakayali H, Haberal M. Tacrolimus-related neurologic and renal complications in liver transplantation: a single-center experience. Transplant Proc 2006; 38: 619-21. 6. Santos MM, Tannuri AC, Gibelli NE, Ayoub AA, Maksoud-Filho JG, Andrade WC. Posterior reversible encephalopathy syndrome after liver transplantation in children: a rare complication related to calcineurin inhibitor effects. Pediatr Transplant 2011; 15: 157-60. 7. Charlton MR, Wall WJ, Ojo AO, Gines P, Textor S, Shihab FS et al. Report of the first international liver transplantation society expert panel consensus conference on renal insufficiency in liver transplantation. Liver Transpl 2009; 15: S1-34. 8. Kamar N, Guilbeau-Frugier C, Servais A, Tack I, Thervet E, Cointault O et al. Kidney histology and function in liver transplant patients. Nephrol Dial Transplant 2011; 26: 2355-61. 9. Kim JY, Akalin E, Dikman S, Gagliardi R, Schiano T, Bromberg J et al. The variable pathology of kidney disease after liver transplantation. Transplantation 2010; 89: 215-21. 10. Pillebout E, Nochy D, Hill G, Conti F, Antoine C, Calmus Y et al. Renal histopathological lesions after orthotopic liver transplantation (OLT). Am J Transplant 2005; 5: 1120-9. 11. McGuire BM, Julian BA, Bynon JS, Cook WJ, King SJ, Curtis JJ. Glomerulophritis in patients with hepatitis C cirrhosis undergoing liver transplantation. Ann Intern Med 2006; 144: 735-41. 12. Hinchey J, Chaves C, Appignani B, Breen J, Pao L, Wang A et al. A reversible posterior leukoencephalopathy syndrome. N Engl J Med 1996; 334: 494-500. 13. Lee VH, Wijdicks EF, Manno EM, Rabinstein AA. Clinical spectrum of reversible posterior leukoencephalopathy syndrome. Arch Neurol 2008; 65: 205-10. 14. Li Y, Gor D, Walicki D, Jenny D, Jones D, Barbour P et al. Spectrum and potential pathogenesis of reversible posterior leukoencephalopathy syndrome. J Stroke Cerebrovasc Dis 2012; 21: 873-82. doi: 10.1016/j.jstrokecerebrovasdis.2011.05.010. Epub 2011 Jun 23. 15. Fugate JE, Claassen DO, Cloft HJ, Kallmes DF, Kozak OS, Rabinstein AA. Posterior reversible encephalopathy syndrome: associated clinical and radiologic findings. Mayo Clin Proc 2010; 85: 427-32. 16. Pirker A, Kramer L, Voller B, Loader B, Auff E, Prayer D. Type of edema in posterior reversible encephalopathy syndrome depends on serum albumin levels: an MR imaging study in 28 patients. AJNR Am JNeuroradiol 2011; 32: 527-31.